The St. Louis Board of Aldermen will meet at 10am today, their 26th meeting of the 2018-2019 session. 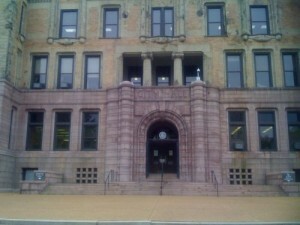 Mayor and Comptroller to enter into a Lease Agreement with FRONT PAGE LOFTS, LLC, to lease property located in City Block 516, for a period of Ten (10) years, and for the purposes of conducting operations of the City of Saint Louis Board of Election Commissioners, and containing an emergency clause. B.B.#176 – Vollmer – An ordinance establishing the Hill Special Business District pursuant to sections 71.790 through 71.808 of the Revised Statutes of Missouri, setting its boundaries; a tax rate, initial rate of levy subject to the approval of the qualified voters, and uses to which revenue may be put; creating a Board of Commissioners; and containing severability, effectiveness, and emergency clauses. B.B.#177 – Guenther – An Ordinance recommended by the Board of Estimate and Apportionment authorizing The City to issue its Taxable Industrial Development Revenue Bonds (Anheuser –Busch, LLC Project), Series 2018, in a principal amount of not to exceed $75,000,000 for the purpose of providing funds to pay the costs of acquiring certain equipment for an industrial development project in the City; approving a plan for such project; authorizing and directing the Mayor and the Comptroller to execute certain documents related thereto; and authorizing and directing the taking of other actions and approval and execution of other documents as are necessary or desirable to carry out and comply with the intent hereof. B.B.#178 – Ogilvie – An ordinance authorizing and directing the Mayor and the Comptroller to execute a permanent, irrevocable Easement, which shall give, grant, extend and confer on the City, its agents, successors, and assigns, the exclusive right to build and maintain a span of sidewalk improvements along the east side of Sulphur from the intersection of Sulphur and Manchester to the driveway to the north; and containing a severability clause. B.B.#179 – Arnowitz – An Ordinance establishing a two-way stop site at the intersection of Adkins and Poepping regulating all traffic traveling northbound and southbound on Adkins, and containing an emergency clause. B.B.#180 – Martin – An ordinance any and all private construction projects, and building or property maintenance performed within the City, except for single family homes and multifamily dwellings with four (4) or less units, that receives either City revenue bonds, City tax-credits or abatements, or, any other form of City public financing including that resulting from tax increment financing or special taxing district, or is performed on buildings or properties owned by the City that are leased to a private entity must, at a minimum, abide by all applicable City ordinances, rules and regulations, and state and federal laws, rules and regulations regarding minority participation and prevailing wages as provided under RSMo. 290.210 – 290.340 as such statute exists as of November 2018, and all applicable City ordinances, state and federal laws, rules and regulations regarding insurance and tax requirements required of public works. B.B.#181 – Boyd – An Ordinance establishing a temporary, three-way stop site, which shall be and remain in place for a period of six months starting from the date on which said stop site is installed at the intersection of Blackstone and Wells regulating all traffic traveling eastbound and westbound on Wells at Blackstone and regulating all traffic traveling southbound on Blackstone at Wells, and containing an emergency clause. The meeting begins at 10am, past meetings and a live broadcast can be watched online here. See list of all board bills for the 2017-2018 session — the new bills listed above may not be online right away. The full board will meet again one week from today, then break for winter until resuming on Friday January 11, 2019.